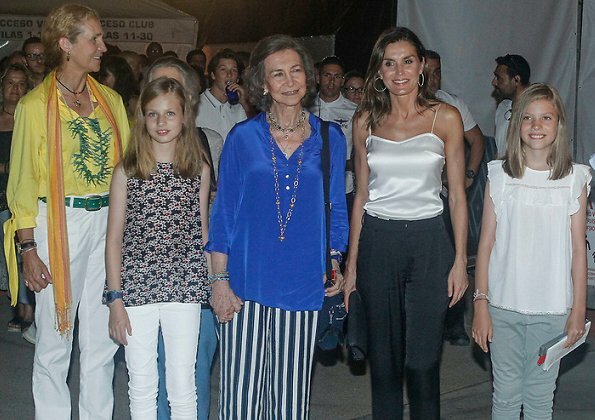 Yesterday evening, on August 1, 2018, King Felipe VI, Queen Letizia, Princess Leonore, Infanta Sofía, Queen Sofia and Infanta Elena of Spain attended world famous Lebanese violinist Ara Malikian's concert held at Adriano Harbour of South Mallorca. No doubt P. Leonor has no troubel to hold her G.Mother's hand. She looks comfortable. So, there's no need "to free her". The whole Family looks properly dressed for this summer concert in an informal place, it's not the Royal Theatre. Leonor no está "confortable" en absoluto, sencillamente está pasiva aguantando el agarre de la abuela. La que está contenta y feliz es la pequeña Sofía, porque va suelta y libre. Apropos yesterday at the market, some pics show that the girls by themselves take Queen Sofia's arm! Sometimes opinions are depending of which pics the blog shows!! Totally agree with Anon 5:15. To me, Leonor does not look comfortable at all! Little Sophia is the happy one for sure, but then Sophia did not try to throw off her grandmother's arm at Easter. Poor Leonor, retribution is not fun. I can't believe the girls are comfortable either. I noticed that Sophia looks much happier than Leonor. And neither of the girls look at their grandmother adoringly like they do when they look at their parents. They are past the age where they want their hands held all the time. If the former queen is having trouble getting around, then someone needs to take her arm, not hold her hand. That is the way to steady her. She does make solo appearances and seems to do fine, never latching on to random children, so I doubt she is unsteady on her feet. We have, however, seen footage of her grabbing the girls for photo opportunities. Most likely, she is not happy with her position as the former queen. She has never really had a private life and I can only imagine how difficult the adjustment must be for her. But it is time for her to let her son do the job he has been trained to do, with his wife by his side, and she needs to respect the girls' space. I have no doubt they have been brought up to do what is right and I am sure they love her. Unfortunately, she is going to end up pushing them away. Millie is right, the girls both seem to reach out to grand mother in those extra pics. Maybe the girls have not got much outside to crowd and feel a bit nervous. They look all more relaxed here than in previous market pics. Quizá la niña Leonor lo necesita, sus padres siempre la agarran o la colocan, Letizia incluso la empuja y siempre la dirige cogiéndola del hombro. Todos van sport excepto Letizia, que va lencera y brilli brilli. Leonor siempre de la mano de su abuela no creo la agrade que no se la considere como una jovencita, en Octubre cumplira 13 años, a esta edad no las gusta nada las besemos, les cojamos la mano delante el colegio, es decir en publico. 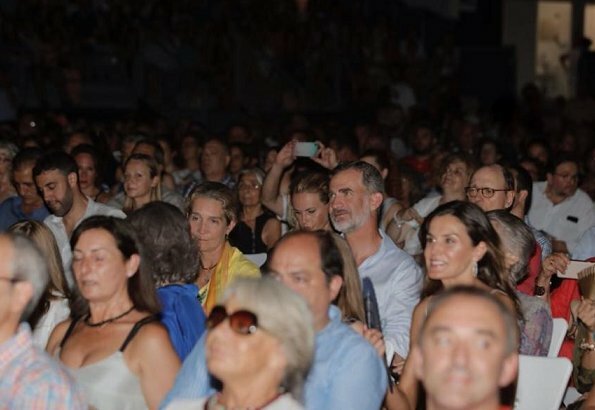 Letizia y Felipe muy atractivos . 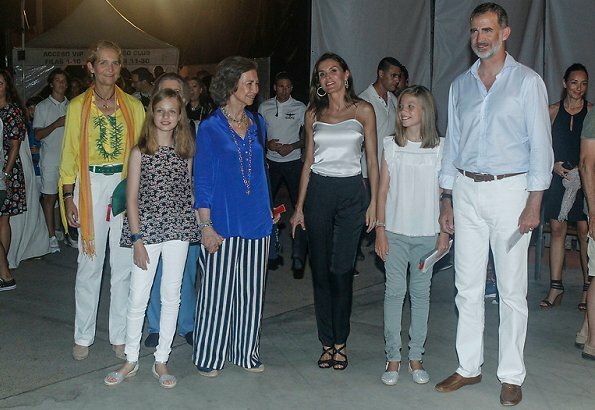 Letizia, Felipe son excelentes padres, son unas niñas muy bien educadas, se comportan bien,son bonitas, herencia de sus padres los dos son guapos. Que disfruten de las vacaciones , que siempre son los utimos a cogerlas y los primeros a retomar el trabajo. En H.K.H. Prinses Irene van Griekenland, de zuster van de Koningin! Und schon wieder hält Oma die Hand der inzwischen 12-jährigen Prinzessin. Ich glaube Letizia muss sich sehr zusammennehmen, damit es nicht öfters mal knallt wie an Ostern. Wäre das meine Schwiegermutter, hätte ich sie längst in die Schranken gewiesen. Ex-Königin hin oder her. In 3 months she turns 13..
@ Beth. If the kid did something wrong (at Easter) reprimand her, accept her apologies and move on. This prolonged being Granny's limpet has seemed to take the joie the vivre out of her and is certainly not a confidence builder. In the pictures, the mom seems to have been sidelined as a result of this too and does not intervene or hardly touches them. Ay Grandma!....Free Leonor! Beth, you are exactly right. I, too, would have put the mother-in-law in her place long ago. But Leti is the queen and must try to make things look smooth, even if they may not be so....Free Leonor, please!! Beth, ich kann jedes Deiner Worte unterschreiben. Aber die Mädels haben auch einen Vater. Ist Felipe so ein Weichei und Muttersoehnchen, dass er sich nicht traut, seine Mutter in die Schranken zu weisen? Auch ich empfinde Holland und Belgien als positive Beispiele. Weder Paola noch Beatrix haben sich jemals als übergriffige Großmuetter gezeigt. Here we go again: firm grip from Granny's hand. Poor Leonor. Never saw other Queens holding hands so tough with their grandchildren like this woman does. What's wrong here?! Muy bonitas fotos, yo veo a la reina muy guapa ! Some Anonymous yesterday startet the "FreeLeonor"-movement. I support it! I support it as well. I'm a few years younger than Queen Sofia. We grandmas need to know when to let go a bit and not make things to be about ourselves. Very nice outfits for a concert. The Family looks happy. 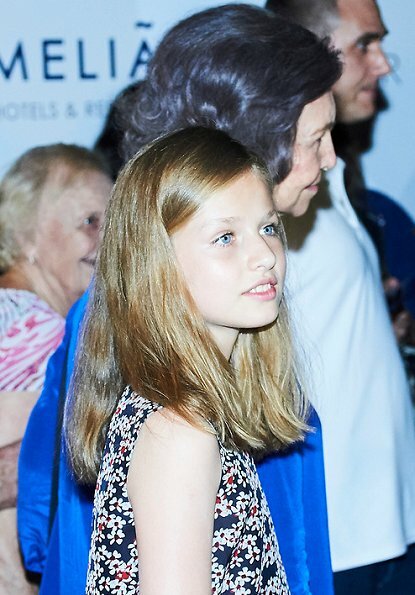 Close knit Family.It seems Pss Leonor has blue eyes and Infanta Sofia brown eyes, very pretty girls. "Anonimus":creo se confundió con otra:no escribí nada!! Wat is er mis met een mooie zomerjurk? Het is hartje zomer; en soms wel 45 graden. De wereld lijkt wel een camping! Daar is niets mis mee, net zo min als met een zomerse jumpsuit. Nice Family outing, cute girls.Their outfits are just right. Girls look very pretty, whether in dresses, shorts, or pants now. They have dressed well each time as most girls this age like a variety of styles. 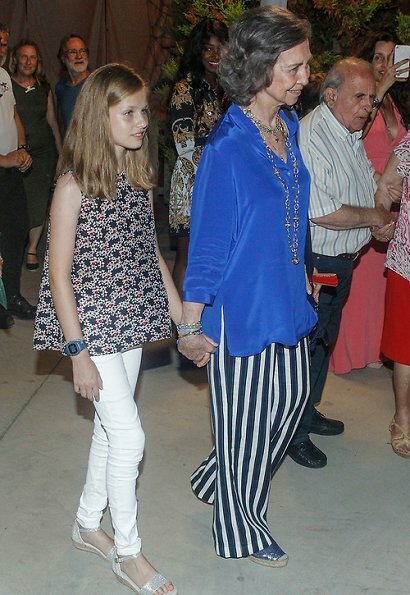 The royal blue blouse is a nice color for Queen Sophia, but those pants are rather clown-like. 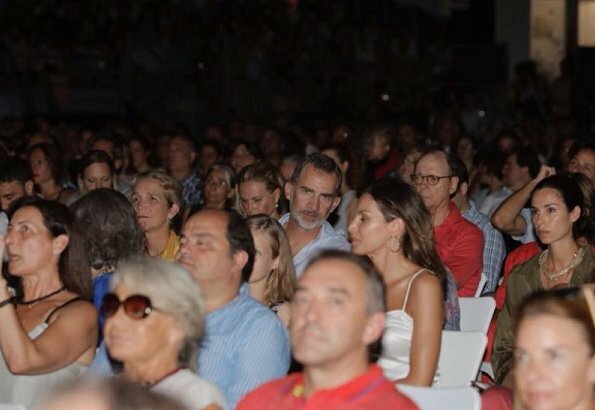 Queen Letizia is gorgeous in black and white, tanned with the white top, wow! 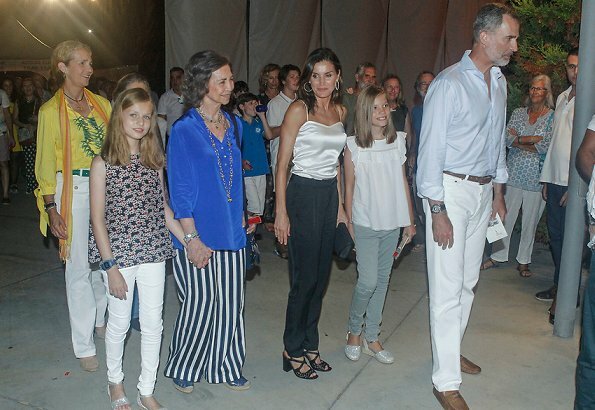 Yes....please free Leonor....hope they have some public appearances with just Felipe, Letizia and their daughters (beside the previous photocall). Would really like to just see the four of them together enjoying their vacation. A Sofia se la ve muy amargada todavia agarrando la mano de Leonor, anda ya y dejale que camine al lado de su hermana y su madre la reina, libres y sueltas. En el posado de La Almudaina, Leonor busca la mano de su padre, y su padre tiene que dársela. Después, es él el que suelta la mano. En el posado de La Almudaina, Leonor busca la mano de su padre, y su padre se la da. Después, él se suelta. Ms. Electra the above comment of Anonymous @2:46 PM, is a total shame, I realize that one must be fluent in Spanish to understand how this person made a play on words in order to insult the infanta Sofia. Sofea= translates to " so ugly"
To insult people is a reflection of unkindness and ignorance, but to insult a child is unacceptable . Not to suggest how you should conduct your forum, but I block nuisance callers on my phone on daily basis. As well as trolls in social media. Some individuals don't belong on a civilized blog. Getting a bit fed up with all the Anonymous posting - it's confusing and increases trolling. It didn't used to be possible- why has that changed? I also dislike the many Anonymous posters - you never know who you are talking with. And usually I don't comment an anonymous post.